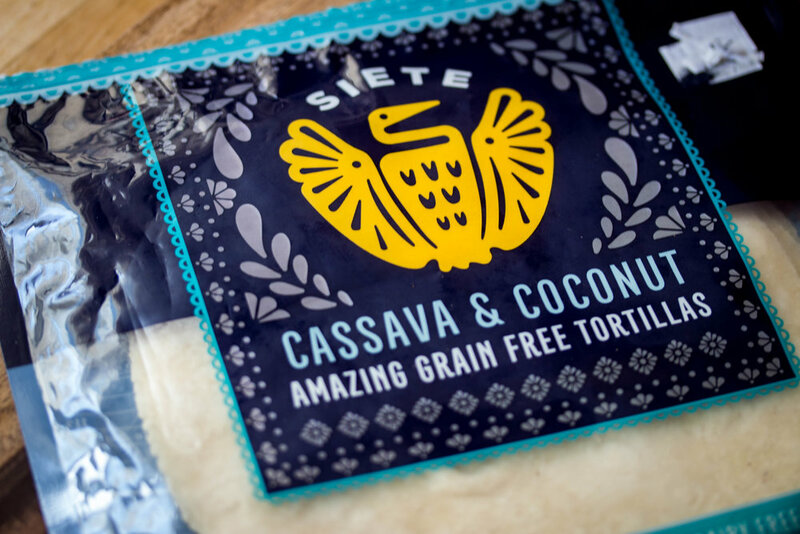 If you haven't tried the Siete Foods brand in general, I suggest you drop everything, go to your local health food store, and grab anything and everything made by Siete Foods. Their grain free tortilla chips and tortillas are absolutely amazing, and a life saver for a paleo-ish eater like myself who is obsessed with Mexican food. These enchiladas are addictive. Yes, there's cheese in the recipe, but you can absolutely make this without it and it will be just as good. Make the red enchilada sauce first. Start by heating olive oil in a large skillet over medium heat. Add arrowroot flour, chili powder, and cayenne pepper to the oil. Stir for about a minute. Add in tomato sauce, chicken broth, garlic powder, cumin, and sea salt. Stir and reduce heat to low. Cook the sauce for another 10 minutes, stirring every few minutes. In the meantime, prep your enchilada chicken filling. In a large bowl, add diced chicken and taco seasoning. Toss together until well combined. If your tortillas are still cold, heat them up on the stove or in the microwave for about 20 seconds. This will make them easier to fold. When your red enchilada sauce is done, take 1/4 of the sauce and spread it thinly on the bottom of a large baking dish. Fill each Siete tortilla with about 1/8 of the chicken and seasoning mixture. Fold and place in the baking dish. It's okay if the tortillas tear a bit. They will all cone together in the end. Top the enchiladas with the rest of the red sauce. Cook enchiladas in the oven for about 20 minutes if using cheese, or 25 minutes if not using cheese. If using cheese, take enchiladas out the 20 minute mark, add the cheese, then place them back in the oven for 5 minutes. Top enchiladas with cilantro and white onions if desired. This is an incredible post workout meal packed with protein and veggies. It's extremely customizable too! Any ground meat and veggies would work with this. Start with this recipe, or use it as inspiration to make your own protein packed power bowl! FYI this recipe uses fish sauce. I use red boat fish sauce as it's one of the only ones out there that's Whole 30 and Paleo compliant. Plus, despite the smell, it TASTES delicious in this recipe. Trust me! Still don't believe me? No worries, you can do without it and this power bowl will still taste great. In a large skillet, heat up extra virgin olive oil and add in the sweet onion. Saute for 2-3 minutes or until onions become translucent. Add in garlic and red potatoes and saute for 10-12 minutes or until potatoes start to soften. Season with salt and pepper. Add in ground beef and saute until the beef is completely browned. Enjoy Add in coconut aminos, fish sauce, and red chili pepper flakes and stir for an additional minute. Enjoy Add in Cruciferous Crunch mix and saute for another 2 minutes. Optional: Garnish with sliced green onions on top. 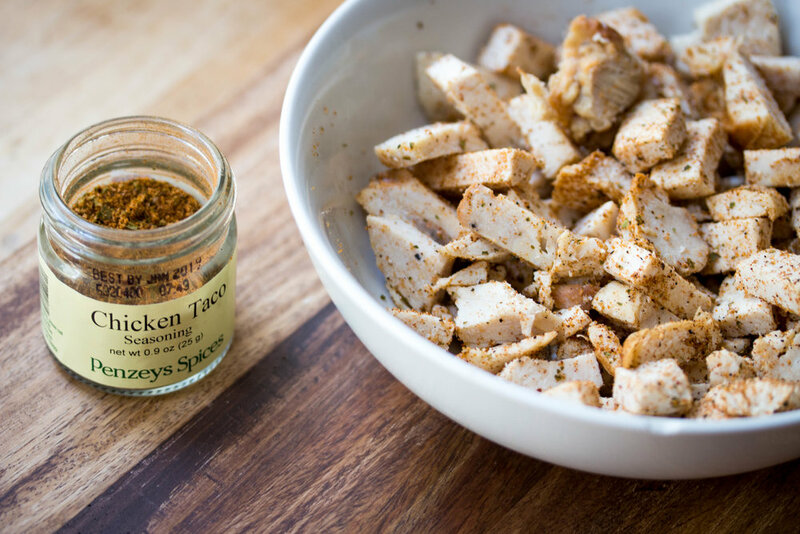 This chicken salad is so quick and easy. 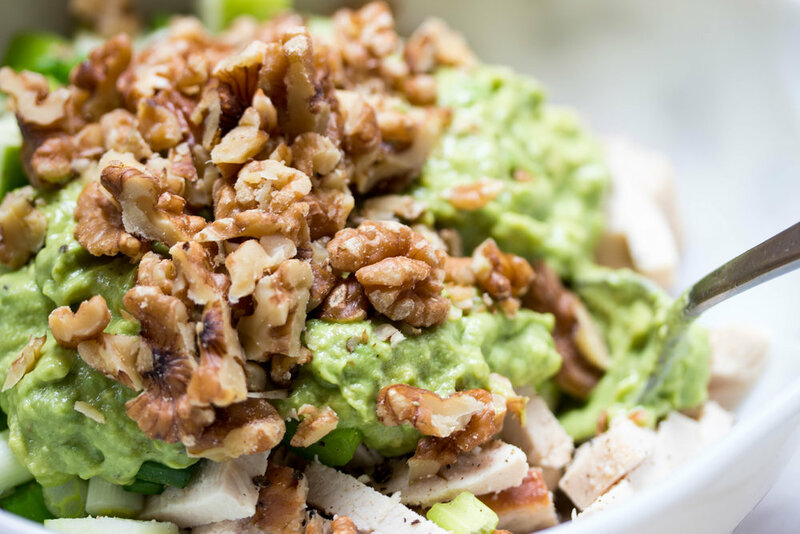 If you have leftover cooked chicken on hand and have no idea what to do with it, make yourself this creamy and smooth avocado chicken salad. Granny smith apples make this salad slightly tart and sweet, and the avocado "mayo" makes everything come together nicely. Add some chopped walnuts for extra crunch! 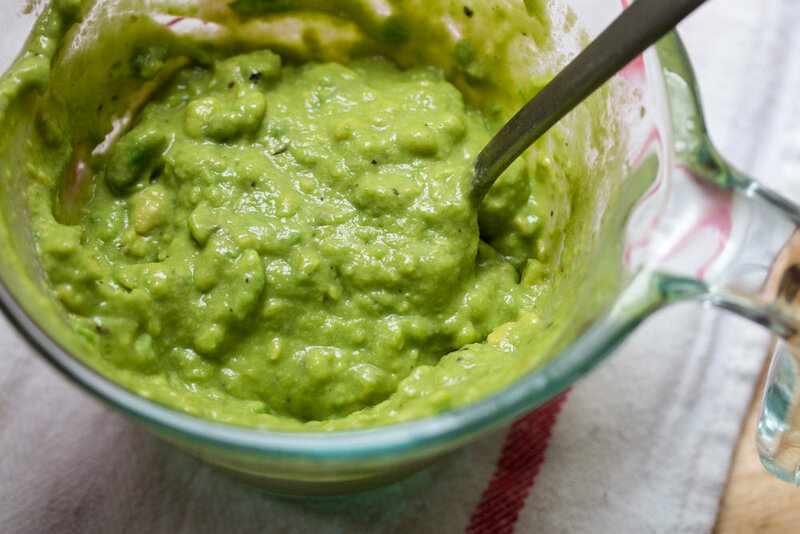 In a small bowl, mix together all the ingreidents for the dressing and set aside. In a large bowl, add all the ingredients for the salad and toss to mix. Pour the dressing over salad and fold in gently until salad is evenly tossed. Tip: If you have leftovers, squeeze lemon juice over the rest of your salad and mix in order to prevent the salad from changing color. There's just something about a Manwich sloppy joe sandwich that I absolutely love. It reminds me of my childhood when my dad would serve the sloppy stuff over a perfectly toasted and buttered hamburger bun. I loved it! This recipe brings me back to those days. Of course you could serve this over a bun instead of a sweet potato, but if you're looking for a paleo option, this is the way to go. Line a baking sheet with aluminum foil. Wash and pat dry your sweet potatoes and then wrap each potato individually in aluminum foil. Set potatoes on baking dish. Bake potatoes in the oven for 45 minutes to an hour, or when soft in the middle. In a large skillet set to medium high heat, add ground beef. Break apart with a wooden spoon, and cook until meat is fully browned. Add in the onion and garlic. Stir until onions are translucent and garlic is fragrant (about 2 minutes). Add in the red and green bell peppers and stir for another 2 minutes. Add can of tomato sauce, tomato paste, apple cider vinegar, dijon mustard, honey, and season with salt and pepper. Stir mixture. Turn heat to low and let the mixture simmer for 12-15 minutes, or until thickened. Once sweet potatoes are cooked, slice them open and spoon a heaping spoonful of the meat mixture into the sweet potato. Thai food is one of my favorite cuisines, and this recipe is one of my favorites to date. 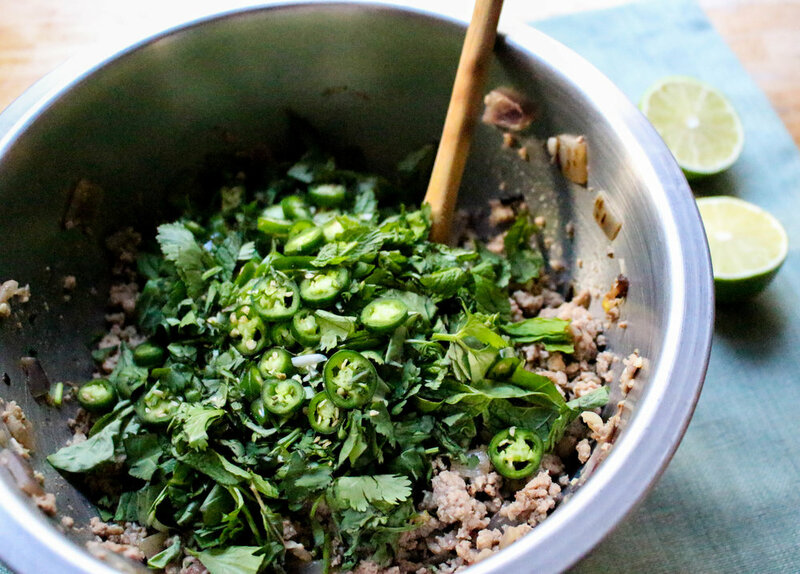 You can make this refreshing Thai larb recipe for lunch, dinner, or even an appetizer. I love the use of fresh cilantro, mint and basil along with the spicy kick of the serrano peppers. I hope you try it! In a large skillet, heat up coconut oil. Once hot, add red onions, seasoning with just a bit of salt, and stir until translucent (about 3 minutes). Add in minced garlic cloves and stir for another minute. Add in ground pork, breaking it up with a wooden cooking spoon. Season with a little more salt and some pepper. Continue to stir until pork is no longer pink, and fully cooked. Remove mixture from heat. Tilt the skillet slightly and use a large spoon to remove the excess fat from the pork mixture. Add lime juice, fish sauce, and coconut aminos and stir. Transfer the meat mixture to a large mixing bowl. Let cool on the countertop or in the fridge for 5-8 minutes. While your meat mixture is cooling, carefully remove individual leaves from the heads of butter lettuce. Rinse leaves and dry with paper towels. Place lettuce cups on a plate with another paper towel underneath. Once meat is slightly cooled, add in the chiles and fresh herbs to the mixture and stir. Serve spooning meat mixture into individual lettuce cups.